Organizaitons are full of employees that smart and driven to excel. They are also eager to find innovative and creative solutions to their clients' problems and ways to work internally. Soft-skills, however, are a key challenge many of them face. Since training at many firms is not mandatory, any course offering must be compelling to encourage participation. 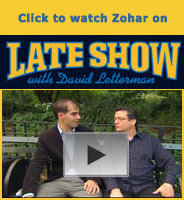 Workshops that incorporate Applied Improvisation and Zohar's stress concepts address that concern with gusto. The methodology is the same as that for learning theatrical improvisation, but applied to today's business challenges. In other words, the sessions are fully interactive, fun and engaging because they are built on a foundation of playing games. Most importantly, the learning is highly effective because play brings out the best in us. There is a lot of new neuroscience backing up how effective play is a learning tool. When we're laughing, we bring more oxygen to our brains; at play the two hemispheres of our brains communicate with each other better; and learning sticks because the Amygdala—our fear sensor—is at rest, allowing the Hippocampus, the part of our brains that is engaged in learning and memory, to function at its fullest. I am very excited about these new discoveries because they provide scientific data to bolster something we have observed for years. More research into Applied Improvisation can be found here. When the key tenets of improvisation – make your partner look good, “yes, and …”, be obvious, commit, there are no mistakes only gifts - take root, individuals and organizations can effectively shift their culture, marketing, and innovations. The art is in applying the concepts. That's where I come in - let's talk. These folks did (good move on their part).